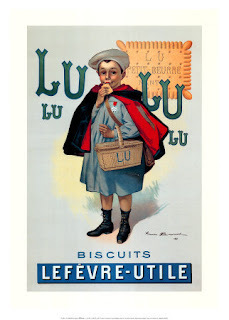 The girls Xmastime interviewed in the video yesterday worked for LU Biscuits and were in the Bryant Park tents every day diligently handing out biscuits, namely Le Petite Ecolier, the chocolate covered ones. The crazy thing is, after eating those biscuits every day for a week (I'm still finding samples in my bags), I never got sick of them. Not once did I look at that little guy and think "ugh, not even with a gun pointed to my head." Instead I now envy not just his chic cape, but also his little wicker basket, which must be a never ending source of biscuits. In this video Xmastime interviews the Blackberry staffers inside the Blackberry lounge at the tents. Afterwards, all I heard about was "Heather Locklear." Today's video will renew his obsession with "Heather Locklear." It will also renew my hatred for my growing-out hair, although it was a night of humidity & hurricane rain so I'd completely given up. Show footage is Rubin Singer and Perry Ellis. Intro footage is from Custo Barcelona and Tibi. Our theme song is Stayin' Alive by the Bee Gees as interpreted by The Royal Wylds. Xmastime's classic white Adidas are courtesy of Foot Locker. My shoes that you can't really see were alice+olivia for Payless and they make me taller than Xmastime. Which is why I wore them, of course. And many thanks to our talented media partner, 3Knights Media. Xmastime hits it again. You two are great together, as usual. I like to eat the chocolate off those biscuits. completely unrelated. well, i guess not, cause of the rain...but i saw a super cute trench coat in banana republic today. very julie christie. thought of you...and then of course, xmastime. ooh! thanks andtheend, must check out esp. if it looks julie christie. although i don't know how i feel about people thinking about xmastime after thinking about me. wendy - do you not eat the cookie in the oreo? enc - i thought so, because LU's really felt like lunch during fashion week. You guys are funny. Nice to see and hear you via vid. Tell Xmastime I used to have a bathing suit poster of Heather on my wall in military school... smokin! Although I now prefer brunettes. LOL...Heather Locklear looks like Joan Van Ark before the all the wicked surgery. Hi there-loved the video!! Way to go Xmastime, in the middle of lovely ladies and biscuits is not a bad job indeed!